Ever wonder what it takes to run and operate a farm? Farming may seem like a centuries-old task of putting seeds in the ground and waiting to reap the harvest, but in the twenty-first century farming and agriculture has become a science. Just ask our farm manger and he will tell you that even after studying horticulture and agriculture for four years in college, farmers still need to have a much deeper understanding than what appears on the surface. The success of a farm lies in its planning. When the hectic pace of the growing season arrives, there is no time to think about planning a farm, or to make important growing decisions. The planning process all starts months before a seed is even started! How Much Produce Do We Need? Here at Sassafras Hill Farm we start planning in December for the upcoming season. We begin by asking ourselves how much or how many of each crop we will need per week to fulfill our CSA, farmer's markets, our retail market and wholesale accounts. Each crop we grow is analyzed for each week of the year that the crop is in season. To help illustrate this idea, check out the summer CSA distribution chart below. Distribution of our summer CSA. How Many Plants Do We Need and When? Once we know an approximate number of crops we need per week, we can begin to count backwards the number of weeks it takes for each crop to reach maturity. Lets take tomatoes for example, as everyone loves a juicy New Jersey tomato. If we want to begin harvesting tomatoes the week of July 12th, and we know that the average tomato takes 80 days to mature from transplant, then we know that the tomato plants need to be transplanted into the field on the week of May 3rd. In order for the tomato plants to be the correct size in order to be transplanted, they need to be started six to eight weeks before they go out. So if we go back another seven weeks from May 3rd, we know the tomato plants need to be started in the greenhouse the week of March 15th! We go through this process for each and every crop that we grow on the farm, and some crops have multiple seeding and harvest dates, so it can get complicated! Some of our seeding rates and seeding charts. Once the start date is figured out for all the crops we grow, how many of each crop becomes the next question! To figure out quantity of each crop we take average yields of each crop and multiply the yield until our desired quantity is reached. For example lets continue with the tomato. By using our own harvest records, and records supplied by the seed companies, we know that on average one row 150 feet in length produces approximately ten bushels of tomatoes per growing season. On Sassafras Hill Farm we grow ten varieties of tomatoes, and by keeping well written sales and harvest records we know our top producing and selling varieties of tomatoes. If we take Mt. Princess for example, a red slicing tomato variety that we sell in quart containers, we know that based off previous sales we need 20 bushels of that specific tomato for the season. Meaning, based on an average yield of 10 bushels per 150 foot row, we need two rows of just Mt. Princess tomatoes. So to fill those two, 150 foot rows of tomatoes, we will need 120 plants per row, or a total of 240 Mt. Princess plants. (The tomatoes are spaced every 15 inches within the row). Knowing how many plants we need, we correlate that we will need to seed 4-72 cell trays of Mt. Princess in March. Planning quantities can be one of the hardest tasks in the crop planning process. Having enough product to sell, and not having an over burden of a crop can be the hardest aspect of farming. Taking into consideration the number of factors that can affect yields such as weather, crop damage and pest damage, forecasting yields takes years of practice and planning; a skill which every farmer modifies and works to improve year after year. After deciding on how many plants we need to start we can then figure out how much seed to purchase. By analyzing each crop, and how many seeds are in an ounce for that crop, we can make the accurate decision of how many seeds to purchase. Tomatoes for example have 8,000 seeds per ounce, or 300 seeds per gram. Based off those numbers we know that on average we will need one gram worth of seeds for each tomato variety that we grow. We calculate and create a seed list each year, so when it comes time to purchase the seeds we know exactly how much of each crop to purchase. By keeping good records we also know if we over or under purchase seed each year, and if need be we eliminate crop varieties based upon growing habits or sales. The bulk of the planning is done when we know how much seed to buy, how many plants we need, and when to start them, and ideally how much yield we will hopefully obtain and when. However, the next step in crop planing is where it will grow! 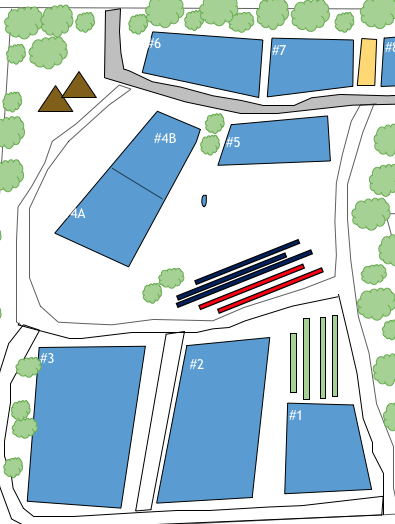 On Sassafras Hill Farm we can split our growing area into about eight individual fields. The planning of what goes into each of these fields and where, is based off a practice called crop rotation. Here on our farm we practice crop rotations, and believe it is part of why we are successful. Each year we plan out where each crop will go into each field, based upon what was in that field the seasons or years prior. For example lets take the tomato. In 2016, the tomatoes were in field #5, and by rotating they will be in field #1 for 2017. The crop rotation is a fairly simple process, each field can not contain a plant in the same family two seasons in a row. To rotate our crops, we usually follow the rotation of cucurbit to solanaceous to brassicas and roots and then back to cucurbit. In non scientific plant family terms, cucumbers are followed by tomatoes, which are followed by Asian greens and broccoli, and then back to cucumbers. Below is an illustration of a crop rotation. Thank you for taking a walk through all of the planning that goes on behind the scenes here at Sassafras Hill Farm. From planning a CSA distribution, to seeding calculations and rates, to purchasing the seed and then the crop rotation scheme, farm planning and being well planned makes all the difference in the world; it separates a well managed farming operation from a farm filled with chaos. Here on the farm we are always striving to become a unified, synchronized and well planned farm. In order to do so we hope you now have a better understanding of how much planning and work it takes before we even till the earth, or sow a seed. We hope you enjoyed this blog post and caught a glimpse into the science of farming. If you have an interest in farming, please visit the volunteering and internships page of our website, as we are always looking for individuals that are as passionate about farming and agriculture as we are here at Sassafras Hill Farm.